There are many skin care treatments available in the market today, all of which include cosmetic surgery, laser surgery, chemical peels, Botox® injections, and other similar procedures. However, at PRASAD Cosmetic Surgery, there are even more methods to treat fine lines and those unwanted wrinkles. 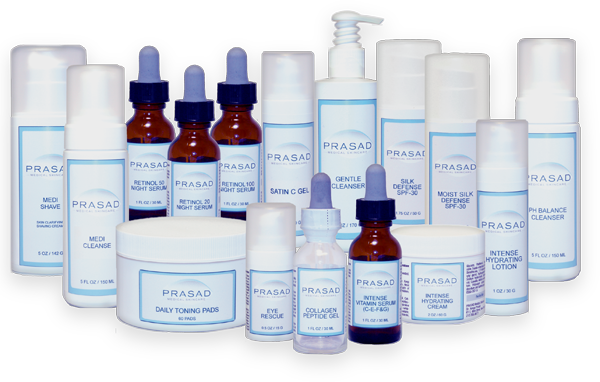 The PRASAD Medical Skincare Line has lotions, creams, gels and serums that you can apply to your skin yourself and without requiring a prescription. A visit to the PRASAD Cosmetic Surgery clinic and the PRASAD Medi Spa will educate you on all of the procedures and products that will help to keep you looking young and refreshed. Oculoplastic surgeon Dr. Amiya Prasad offers a variety of pharmaceutical grade skin care products. Given Dr. Prasad’s interest in eyelid and facial rejuvenation, his practice has expanded to include a Medi Spa offering Photofacial Skin Rejuvenation for Rosacea and brown spots, Pelleve Skin Tightening, Hydrafacial, Microdermabrasion to minimize fine lines and wrinkles, hand rejuvenation, anti-aging products and facials, laser treatments, lip treatments and more. Prasad Medical Skincare’s Collagen Peptide Gel is a Hyaluronic acid-based gel designed to enhance skin moisture, reduce signs of photoaging, and increase production rate of collagen to erase fine lines and wrinkles. This product is a water-based vehicle and is oil-free, fragrance-free and non-comedogenic, appropriate for use under make-up, sunscreen or moisturizer, or as a light-weight moisturizer for acne-prone skin. Prasad Medical Skincare’s Eye Rescue is a high-potency combination of ingredients specifically designed to address the needs of the eye area; combining protective anti-oxidants, soothing emollients and firming peptides. Eye Rescue helps to diminish the appearance of dry skin, fine lines & wrinkles, puffiness, and dark circles under the eyes.